Deputy Chairman of People’s Committee in Ho Chi Minh City Le Thanh Liem ordered Binh Chanh District to have ways to cut traffic accidents, environment pollution and flooding in 2017. At a meeting with Binh Chanh District administration upon plan for 2017 on February 16, Deputy Chairman Liem pointed out missions which Binh Chanh needs to do include having 2,000 newly registered enterprises, speeding up economic growth rate connected with fresh agricultural production, effectively spending state budget. Additionally, the district must diminish traffic accidents, tackle environmental pollution and flooding as well as monitoring illegal construction which have taken place complicatedly lately. The administration strived to collect VND1,471 billion (US$64,716,234) as per the regulation. In addition, the rate of growth of all sector in the district reached 19.50 percent helping to reduce the proportion of poor households to 1.41 percent and generating employment for 6,000 local laborers and controlling criminal surge. Moreover, traffic accidents scaled down by 5 percent on the number of cases, the number of death and the number of injured people. 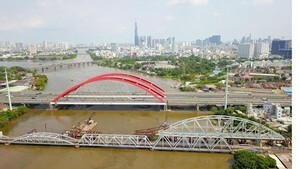 In the first month of the year, the district’s industrial production achieved VND1,973 billion. Besides, 131 newly registered enterprises were established in the district. The district has collected VND216.2 billion, accounting for 14.7 percent of the target. Representatives from agencies said that the district should a road map to remedy its shortcomings such as environmental pollution, land management.